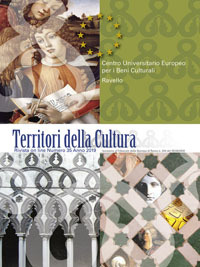 Venue : European University Centre for Cultural Heritage, Villa Rufolo, Ravello, Italy. Addressed to: scientists, architects, engineers, conservators, urban planners. The Course is addressed to young advanced students and professionals. The lecturers belong to European Universities, National Research Centres and International Organisations. The entire Course will be held in English. There is no fee for participation. On request, students may benefit of 3 ECTS (European Credit Transfer System) after agreement with their own university. The organisation has the possibility to support the participation of 20 students with a reimbursement of € 300 (at the maximum) of their participation expenses, after presentation of receipts. The selection for grant will be done by the organisers. For further information about accommodation please contact the Secretariat of the Centre.